A Bosnian Croat war criminal has died after drinking poison during an appeal hearing in The Hague. Slobodan Praljak, 72, died in hospital, with the UN court announcing that the courtroom was now "a crime scene". On hearing that his 20-year jail term had been upheld, the ex-commander of Bosnian Croat forces said he was not a criminal and then drank from a bottle. In 2013, he was sentenced for crimes in the city of Mostar during the Bosnian war from 1992-95. Praljak was one of six former Bosnian Croat political and military leaders up before the International Criminal Tribunal for the former Yugoslavia (ICTY). They were attending the final appeals judgment to be handed down by the court. Though allies against the Bosnian Serbs in the war, Bosnian Croats and Muslims also fought each other for a period of 11 months, with Mostar seeing some of the fiercest fighting. 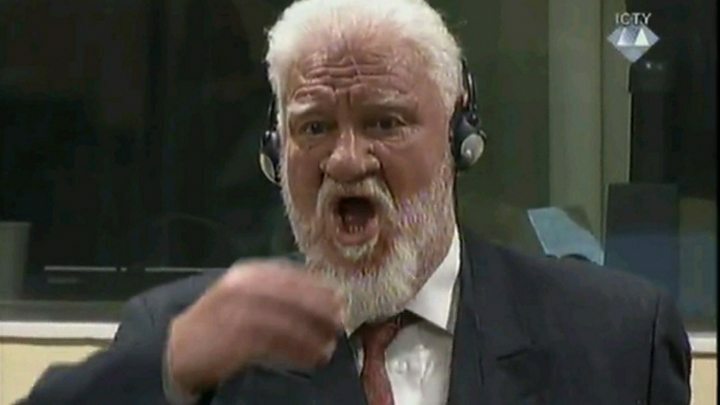 After hearing the verdict, General Praljak stood and raised his hand to his mouth, tipped his head back and appeared to swallow a glass of liquid. "I have taken poison," he said. Presiding judge Carmel Agius immediately suspended the proceedings and an ambulance was called. "Okay," the judge said. "We suspend the... We suspend... Please, the curtains. Don't take away the glass that he used when he drank something." An ambulance could later be seen arriving outside the tribunal while a helicopter hovered above the scene. Several emergency rescue workers also rushed into the building carrying equipment in backpacks. In a statement, the ICTY said Praljak "was immediately assisted by the ICTY medical staff". It said Praljak "was transported to a nearby hospital to receive further medical assistance where he passed". An independent investigation is now under way. Meanwhile, Croatian Prime Minister Andrej Plenkovic said he regretted the death of Slobodan Praljak. "His act, which we all unfortunately witnessed today, speaks most of a deep moral injustice towards six indicted Croats from Bosnia and the Croatian people. "The government expresses its condolences to all victims of all crimes committed in the war in Bosnia-Herzegovina. We voice dissatisfaction and regret about the verdict," Mr Plenkovic said. Natacha Gaveau Ivanovic, Praljak's lawyer, told the BBC that she did not believe the tribunal treated her client fairly. "I have no idea what happened and how it happened but for me what is very important, more important is why he did it," she said. The lawyer said she thought her client drank poison because he believed that he was an "innocent man". She said that he had the right to "consider that" because the tribunal "didn't limit itself to judge just personal responsibility, they took on them to judge [the] politics of people, of a state, the history". She added: "It's very hard from the people who are from this country to accept that, and actually they cannot accept it." Praljak, the former commander of the main staff of the Bosnian Croat defence forces (HVO), was jailed for crimes against humanity. Informed that soldiers were rounding up Muslims in Prozor in the summer of 1993, he had failed to make any serious efforts to stop the action, the UN war crimes tribunal found. Praljak had also failed to act on information that murders were being planned, as well as attacks on members of international organisations and the destruction of the city's historic Old Bridge and mosques. Those appearing with him included Jadranko Prlic, the former prime minister of the Bosnian Croats' breakaway statelet. Set up by mandate of the UN Security Council in 1993, the ICTY is due to close when its mandate expires at the end of the year. What now for Bosnia victims as Hague tribunal closes?